Misamis University was identified by the Department of Environment and Natural Resources-Mt. Malindang Protected Area Office to conduct a resource assessment for Biodiversity Assessment and Monitoring System (BAMS). This will be conducted through the Misamis University Community Extension Program (MUCEP). The MU researchers served as the technical service providers with knowledge and skills in assessing the terrestrial ecosystem in the southern portion of Mt. Malindang Range Natural Park. The Misamis University field project team was headed by For. Engr. Alfredo F. Garrido Jr from the College of Agriculture and Forestry with For. Jersam C. Calago and Eugene V. Villantes for the flora inventory, while Asst. Prof. Yunalyn Labajo-Villantes led the fauna inventory with Clifford Bendoy, Jonas T. Hingco and Mark Anthony Manapsal, faculty and staff of the Natural Science Department-College of Arts and Sciences. The MU team was joined by two DENR personnel, two Mt. 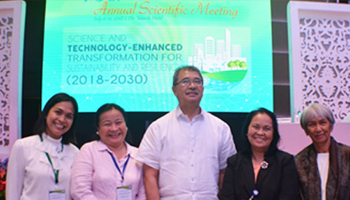 Malindang task force volunteers, and seven local researchers, with MUCEP Director Grace V. Villanueva as project leader. The team chose the natural forest located in Brgy. Hoyohoy, Tangub City because of the good peace and order situation, diversity and accessibility. They established a two- kilometer transect line and stayed in the area for several days at a time. Standard methods were used to sample and assess flora and fauna resources that include biometry and morphometry measurements, identification, photo documentation and voucher collection. After more than 10 days of sampling, various species of plants such as trees, shrubs, ferns, orchids and mosses were observed in the area. Many types of arthropods such as insects and arachnids were recorded. Slimy frogs,snakes, colorful birds, tarsiers, forest rats and bats were also discovered. The recent resource assessment provided the baseline data for the Biodiversity assessment monitoring that will be the key activity in protecting and conserving Mt. Malindang Range Natural Park. The results of the BAMS will be submitted to DENR Misamis Occidental, and will be uploaded in its website.